Background: Elastography in ultrasound and MRI relies on the mechanical stimulation of soft biological tissue and measures the elastic response as a biomarker sensitive to many diseases. In MR elastography (MRE) time harmonic waves are used for mechanical tissue stimulation. Time-harmonic waves in the low audible range can penetrate the whole body and enable the mechanical investigation of many organs such as the brain, the liver or the heart. Ultrasound elastography (USE) is capable of measuring time-harmonic shear waves in real-time at low costs. Problem: An ill-posed inverse problem has to be solved for the elasticity reconstruction based on time-harmonic shear waves. In contrast to MRE, USE does not provide full vector fields in 3D and thus the reconstruction of meaningful elasticity constants is especially challenging. Proposed solution / current status of the project: In heart elastography, we pursued an approach different to classical wave field reconstruction in MRE or USE: Analyzing the alteration of shear wave amplitudes provides sensitivity to the change of the shear myocardial shear modulus during the cardiac phase. Notably, we do not solve an inverse problem and thus obtain a well-behaved non-invasive measure of myocardial mechanics and ventricular pressure. This principle was first introduced by our group to cardiac MRE [1,2] has been adopted by USE and successfully demonstrated in 20 healthy volunteers . Continuing work focuses on diagnostic applications e.g. 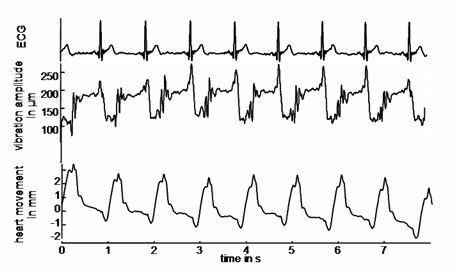 the detection of myocardial relaxation abnormalities. This project received the DEGUM science award 2012.